SEESHAUPT — The men from Lódź, Zagań, Poznań and Warszawa who make up the Meccore Quartet bring phenomenal energy to their work. So goes their reputation, and so it was last Thursday (June 9) here in the Alte Post’s Festsaal on the south shore of Lake Starnberg. Energy, and virtuosic refinement. The Meccore has a way of sustaining vitality all through a piece while tempering the robustness of its sound, texturally, to achieve precise degrees of expression. Sculpting, in a sense. On this occasion the group played standing, with thoughtful cellist Karol Marianowski on a high dais and honey-toned violist Michał Bryła stage left. Wojciech Koprowski and Jarosław Nadrzycki, well matched, alternated on first and second violin. Not everything worked. 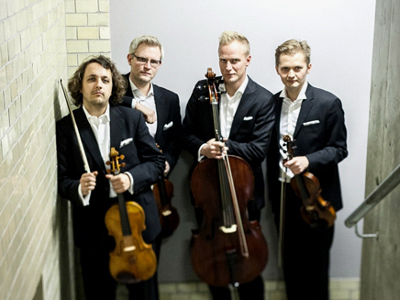 Haydn’s C-Major String Quartet, Opus 50/2 (1787), fairly blasted across the Festsaal thanks to bright venue acoustics. That was too bad. Then again, the technically flawless reading lacked repose and Classical grace. For Beethoven’s Opus 18/4, in C Minor (1801), the musicians adopted brisk tempos and made steely use of contrasts, to gripping effect in this resilient score. The Scherzo and Minuet, marked Andante scherzoso quasi allegretto and Allegretto, respectively, passed without a trace of humor or elegance yet commanded attention on purely abstract terms. After the break, with Nadrzycki now in the first chair, the D-Major String Quartet of Tchaikovsky (1871) unfolded in deep colors, if less introspectively than usual, its singable second movement garden-fresh and exquisitely pointed. The nine-year-old Meccore has two U.S. tours under its belt (2013 and 2015), an emergent reputation in Germany, and a recording contract with legacy Polish label Muza, today a Warner imprint. On CD: Szymanowski’s quartets coupled with the Debussy. Upcoming: a teach-and-share engagement at McGill. This entry was posted on Saturday, June 11th, 2016 at 2:14 pm	and is filed under Munich Times. You can follow any responses to this entry through the RSS 2.0 feed. Both comments and pings are currently closed.